There are some definite pros and cons pertaining to spring as the season rolls into April. On the plus side, one does not have to dress like they’re going on an arctic expedition every time they wish to go outside. The scope of outdoor activities opens up as the temperature continues to rise and foliage once again becomes green and vibrant. However, the old saying of “April showers bring May flowers” is often true as rain storms can roll in unexpectedly. 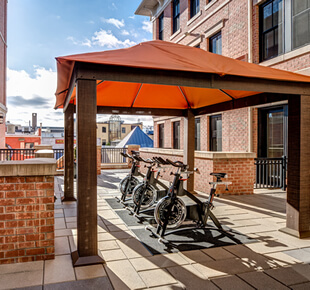 Having a deluge of rain will bring a swift end to any outdoor fun, but luckily for those residing at The Avenue at South Orange, New Jersey, there are many fun indoor activities that can be found in close proximity. The township of South Orange, New Jersey, boasts a population of 17,021 individuals as well as a unique character. (1) The abundance of pre-WWII architecture and 1,438 gas streetlights give the township a quaint and historic character. (2) Locals enjoy the high number of outdoor activities that can be found in and around South Orange, such as the South Mountain Reservation and Greenwood Gardens, but spring means storm clouds can sweep in at any time and wreak havoc on any previously-made plans. However, locals have a lot of indoor options that promise fun no matter the weather. Residents of The Avenue that enjoy fine art make it a point to regularly visit the Pierro Gallery of South Orange (PGOSO). The gallery hosts up to seven exhibitions yearly that feature upcoming and established artists with a particular focus on regional artists. Another great venue where one can beat inclement weather while being culturally enriched is the Paper Mill Playhouse. Benny & Joon, a musical, is playing from April 4th through May 5th. (4) Parents will love the various productions geared toward children. The next such show is The Velveteen Rabbit on April 27th. Another popular choice to stay dry when the weather turns bad is the South Orange Public Library. Not only can one select a book and enjoy some quiet reading as rain falls from the heavens, but there are a good number of programs offered by the library. Computer classes, Minecraft-playing sessions, story times for babies, and fun with Legos are regularly offered. A Ping Pong tournament is being held on April 29th. (5) Several writing classes are being held throughout April, not to mention the screening of several movies, such as Bohemian Rhapsody and Green Book.